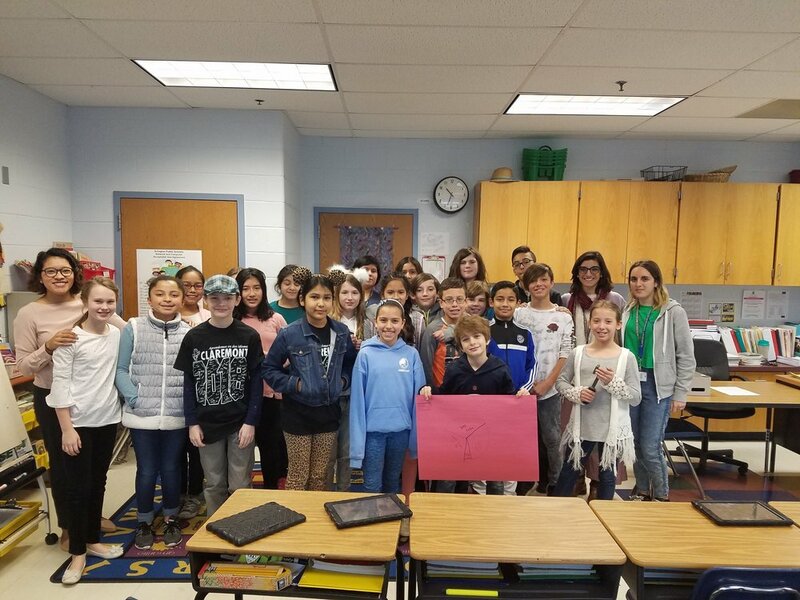 At Claremont Immersion Elementary (Arlington Public Schools), fifth grade teacher Wendy Bermudez had her class engage in the popular role play, The People vs. Columbus, et al. The lesson, written in the form of a trial by Bill Bigelow of Rethinking Schools, is available for free download on the Zinn Education Project website. The trial was part of a larger unit on persuasive writing and took place entirely in Spanish. Prior to this unit, students wrote informational texts in the form of brochures about ancient civilizations. One of the civilizations students were assigned were the Taínos. Ms. Bermudez purposely structured the course in this way so students would gain background about the Taínos before engaging in the The People vs. Columbus, et al mock trial. At the start of the persuasive writing unit, students were divided into five groups, each one charged with the murder of the Taínos: Columbus’s men, Columbus, King Ferdinand and Queen Isabella, and the Taínos. Each group was given an indictment, in Spanish, which they were to read and use to brainstorm a list of reasons for why their character was guilty of murdering the Taínos. Students then were required to use this brainstorm to develop an opening statement in which they listed reasons for why their character was innocent and identify a reason for why another character was guilty. Ms. Bermudez and Patricia Seidler, the Spanish Language Arts teacher, assembled and translated a variety of primary and secondary source documents for each group which students used as evidence in their case. Students analyzed these documents and incorporated them into their arguments. On the day of the trial the judge, Ms. Seidler, introduced the charges for each group. All students in the groups were responsible for presenting an aspect of the argument. One student read an opening argument which summarized the reasons for why their character was innocent and identified why one other character was guilty. Two other students presented a more detailed paragraph of their arguments supported by evidence for why their character was innocent; while the third student presented a more detailed paragraph of arguments with evidence for why another character was guilty. The last student read a closing statement which was a summary of the main arguments in the case. A jury of five students sat listening intently as each group presented. The Taínos are accused of not fighting back against Columbus and his men but that is not true. Yes, we did fight back but Columbus and his men were violent towards the Taínos ; they chopped off our hands if we did not get enough gold and they mistreated our women. According to Howard Zinn, Columbus and his men were only interested in “slaves and gold.” Columbus and his men took advantage of us and treated us with violence and enslaved us in order to get gold. Columbus is guilty because he sent a letter to King Ferdinand and Queen Isabella promising more gold and slaves in exchange for additional economic support. King Ferdinand and Queen Isabella are guilty because they could have told Columbus no when he sent a letter requesting more support. Instead they continued to fund his expedition, encouraging his action, in the hope of getting more gold and slaves as Columbus promised. The King and Queen just wanted to be more rich and powerful, without their monetary support Columbus would not have been able to continue his expeditions. In addition, the King and Queen did not care about the Taínos’ lives because some of them refused to convert to Christianity. In Spain the King and Queen persecuted anyone who did not convert to Christianity and they encouraged this same method in the Caribbean toward the Taínos . Why did you want to expand Spain? If Columbus did get to Asia, what would you have done? Wouldn’t you have also tried to control Asia? Why did you want gold upon arriving to the Caribbean when your goal was spices? Why did Spain want to be richer if it was already rich? We wanted to expand our empire like other countries were doing. We wanted spices from Asia. In this time period it was common for explorers to go and enslave those they conquered. Columbus admired Marco Polo and he brought gold and spices back so he could imitate his role model. As students completed a reflection, the jury went to another room to discuss sentencing. The jury decided to give each group a percentage of guilt recognizing that everyone in the group was accountable (to some extent). King Ferdinand and Queen Isabella were 35% guilty as was Columbus, while Columbus’s men were 25% guilty and the Taínos were only 5% guilty. Some students respectfully challenged the jury’s verdict asking questions such as, why should Columbus and the King and Queen get equal culpability? Or, why didn’t Columbus men get more culpability if some of them killed the Taínos for fun? This lesson challenges what students have learned about Columbus and provokes political awareness. Without prompting from Ms. Bermudez, several students began questioning why Christopher Columbus, who committed such horrible acts against the Taínos, received a holiday.